Editor’s note: This post was the very first one ever published at Appellation Mountain, on January 23, 2008! It was revised and reposted on January 26, 2012. Nicole Richie and Joel Madden named their new little one Harlow Winter Kate. Their daughter arrived on January 11, 2008, and the name has caused a sensation. She’s a glamorous choice, one that has quite a bit in common with another celeb-inspired favorite: Ava. Let’s take a closer look at Hollywood baby names. Back in 1999, when Reese Witherspoon and Ryan Phillipe christened their little starbaby Ava Elizabeth, the name was the 259th most common name given to girls born that year. Not as rare as Hortense or Phyllidia, but a far cry from #1 name Emily. Fast forward to 2011, and Ava has jumped to #5. In fact, Ava has never been as popular as she is today. Back in the 1980s, she wasn’t even in the Top 1000. 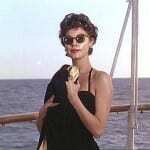 Oscar-nominated screen siren Ava Gardner has kept her name familiar. She conjures an old Hollywood glamour – think white fox fur shrugs and mirrored dressers. It’s a throwback name like the chart-topping Hannah, but while Hannah’s vibe is more Little House on the Prairie, Ava is all about the glitz. If you’re an old film buff, you’ve probably already made the connection. Ava Gardner would have been gracing the silver screen in the same era that Jean Harlow’s name regularly appeared in lights. And so I submit that Harlow, while a bit more extreme than Ava, is actually just a logical progression of the Hollywood baby names trend. Olivia de Havilland played sweet, loyal Melanie in Gone With the Wind early in her career, and won a pair of Oscars for her later work. #4 in 2011. The classic Elizabeth brings to mind saints, queens, and screen legend Elizabeth Taylor. Elizabeth ranked #11 last year. Natalie brings to mind Christmas, and the lovely Natalie Wood. She stood at #14 in 2011. There are plenty of reasons to recommend Grace, but the luminous Grace Kelly is surely one of them. #16 in 2011. Gamine Audrey ranked #43 in 2011. Back to Liz Taylor – could Taylor be the real forerunner of Harlow? The cinematic surname ranked #44 in 2011. There’s also Stella – as in Adler. She was more famous as a drama teacher than an actress, but I think her name still works as a glamorous choice. #73 in 2011. Vivien – Vivien Leigh played Scarlett O’Hara, among many other memorable roles. Thanks to Vivienne Jolie-Pitt, the -enne spelling is more popular, but she still shimmers. Vivienne ranked #383 in 2011, while Vivian came in at #154. If Taylor paved the way for parents to consider Hollywood surnames, then Harlow is the most successful of the bunch. We’ve also heard Bardot, Chaplin, and Monroe. But at #621 in 2011, Harlow feels like the one most likely to catch on. She’s a surname name, a sister for Madison or Riley. Ends with-o names are quite stylish. Harlow’s H is also a favorite letter for celeb kids. Think of Hazel, Hattie, and Harper. I predict that we’ll see this one crack the Top 1000 by 2010 – if not sooner. Now that Harlow is climbing up the charts, the only question is how high she’ll climb. It’s odd how much I LIKE the name harlow Winter Kate, considering that the mom is a bit trashier than I like my celebs. But I think she did a seriously nice job naming that baby and have considered the name Harlow for a future daughter that might come my way. Winter isn’t my favorite, but the three names go nicely together.